Since 7 January 2016 I have a subscription to Netflix. This streaming service was not available to us before this date. My decision to favour streaming and not use a local Sat service was based on the fact that I did not want an annual contract subscription. Netflix is month by month and you can discontinue at any-time. Streaming in Mauritius is not perfect due to poor internet connections. I have used Netflix over several days to check how streaming performs with an Emtel Airbox 30Mbps subscription to my tablet then Chromecast to the TV. In general I am getting good results during afternoon viewing. However, in the evening, when there are more internet users online, I sometimes get two or three incidents of annoying lagging. This lagging can also hang the streaming process and stop buffering. 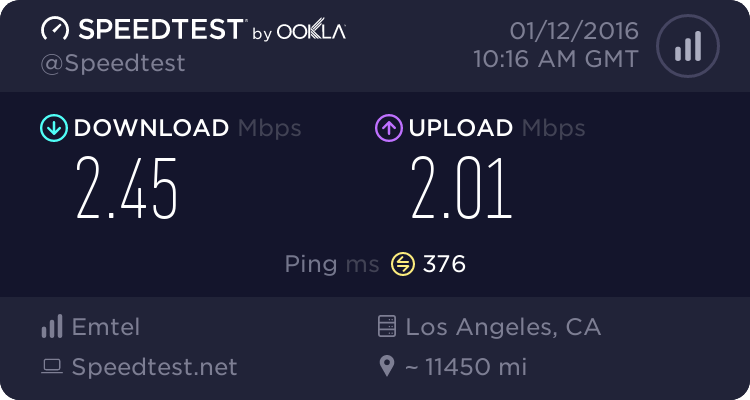 This then requires that I disconnect and reconnect to allow buffering to continue or restart the streaming. While streaming services are a welcome addition to media entertainment you do need a good internet connection, in other words good bandwidth provision. A simple explanation on how much bandwidth you need for streaming video on this link. Indeed, if I connect to LA Calif. server then this is the result. So some of us struggle along with the reality of internet services here.